One King size and two single beds. Tawni Safari Lodge spared no attention to detail. 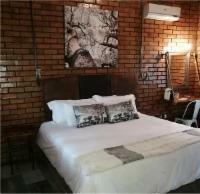 All our rooms are designed and decorated with hand crafted furniture and decorations, high quality linen and appliances. Luxury en-suite room with a king size bed. Tawni Safari Lodge spared no attention to detail. All our rooms are designed and decorated with hand crafted furniture and decorations, high quality linen and appliances. En-suite room with a double bed. Tawni Safari Lodge spared no attention to detail. All our rooms are designed and decorated with hand crafted furniture and decorations, high quality linen and appliances. En-suite room with a queen size bed. Tawni Safari Lodge spared no attention to detail. All our rooms are designed and decorated with hand crafted furniture and decorations, high quality linen and appliances. Chalet with 2 bedrooms, one king size bed and two large adult bunk beds. Two bathrooms, lounge and kitchen area. TV with DSTV, tea and coffee tray. Chalet with 4 bedrooms, two king size beds and four large adult bunk beds. Two bathrooms, lounge and kitchen area. TV with DSTV, tea and coffee tray. The ultimate unique open air venue for special events.The Bush BBQ Tree is surrounded in pristine Limpopo Bushveld with breath-taking views.